I started developing this blog more than three years ago. After a bit more than a year, I collected a bunch of the posts, edited them and published them as a book on Amazon. Recently, I logged into my Amazon profile to see how the book was doing, and I was very pleased to notice that there were no less than four reviews of the book, and very positive ones too! Thank you to everyone who read/browsed it. Blastocystis research is currently a quickly moving field, and I'm please to be able to inform you that one of the most interesting contributions to Blastocystis research coming out from our intstitute has just been published in Fems Microbiology Ecology. The article appearing in this journal was first-authored by PhD student Lee O'Brien Andersen (Statens Serum Institut) and post doc Ida Bonde (Danish Technical University) and describes how Lee and Ida took a retrospective approach to analysing metagenomics data originally generated by the MetaHIT Consortium and published in the often cited paper by Arumugam et al. (2012). 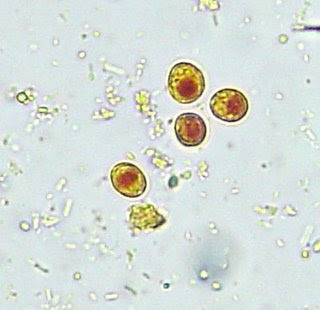 Blastocystis is a common single-celled intestinal parasitic genus, comprising several subtypes. Here, we screened data obtained by metagenomic analysis of faecal DNA for Blastocystis by searching for subtype-specific genes in co-abundance gene groups, which are groups of genes that co-vary across a selection of 316 human faecal samples, hence representing genes originating from a single subtype. The 316 faecal samples were from 236 healthy individuals, 13 patients with Crohn's disease (CD), and 67 patients with ulcerative colitis (UC). The prevalence of Blastocystis was 20.3% in the healthy individuals and 14.9% in patients with UC. Meanwhile, Blastocystis was absent in patients with CD. Individuals with intestinal microbiota dominated by Bacteroides were much less prone to having Blastocystis-positive stool (Matthew's correlation coefficient = -0.25, P < 0.0001) than individuals with Ruminococcus- and Prevotella-driven enterotypes. This is the first study to investigate the relationship between Blastocystis and communities of gut bacteria using a metagenomics approach. The study serves as an example of how it is possible to retrospectively investigate microbial eukaryotic communities in the gut using metagenomic datasets targeting the bacterial component of the intestinal microbiome and the interplay between these microbial communities. As far as we know this is the first study to sift out data on Blastocystis from data originally intended for analysis of bacterial communities only, and in the paper we describe how this was done. We believe that this approach has imminent potential for quickly advancing our knowledge on Blastocystis in a gut ecology context, including knowledge on the role of Blastocystis in terms of impacting/manipulating one or more types of intestinal bacteria. I have a feeling that this is the first study in a string of similar studies that will soon hit PubMed, and within a year or two, we should be able to with confidence to hypothesise on the relationship between the structure and function on of the gut microbiota and Blastocystis, and–hopefully–other intestinal micro-eukaryotes. Lastly, it was very interesting to note the article by Paramsothy et al. on donor recruitment for faecal microbiota transplantation (FMT; never heard of this? Watch the video below to learn more), recently appearing in the journal Inflammatory Bowel Disease. The study is interesting because it shows that most FMT donors are seemingly ineligible due to a variety of reasons, including colonisation by intestinal parasites such as Blastocystis... Given emerging data suggesting that Blastocystis is more common in healthy invididuals than in patients with gastrointestinal disease, the question remains whether Blastocystis-positivity should be a limiting factor for stool donation? For a parasitologist with a major interest in novel technology like me the Cell Symposium on Microbiome and Host Health (#CMHH) was a challenging, yet stimulating tour de force in bacteriology and immunology, and I realise that gut fungi and protists still fly below the radar of intestinal microbiome research. The announced line-up of speakers was impressive, and although we missed e.g. Drs Peter Turnbaugh and Fergus Shanahan, we were still spoiled with brilliant talks. Most of the projects and results presented on the meeting were based on studies on bacterial diversity and structure by either targeted 16S 454 sequencing or metagenomics, while studies of gene function and the 'super-organism' that is the complete microbiome (including the fungome and protistome I should say, since these genomes are much larger than bacterial ones) were still scarce if represented at all. Since my focus is on intestinal parasites, my main interest in the vast universe of the human microbiome naturally orbits around the intestinal microbiome. Although there is still a long way to go - due to e.g. significant differences in methodologies and lack of consensus on the analytical basis for 'enterotypes' - we are slowly but steadily building up a picture of the effect that the human microbiome has on health and disease. Hundreds of species live and have important functions in our gut, to cite Dr Peer Bork, but these species have also been associated with more than 30 human diseases, even neurological ones. Shifts in the composition of the microbiome are associated with an expanding list of chronic diseases that includes obesity, inflammatory bowel disease, and diabetes (Dr Ruth Ley). Many things may influence our susceptibility to intestinal pathogens, including competition between species (colonisation resistance), the ability of some bacteria to synthesise antimicrobial compounds or stimulate innate immune defenses. Differences in susceptibility to infection may boil down to differences in antimicrobial compounds secreted by our individual microbiota (Dr Michael Fischbach). Bacteroides fragilis is a commensal immunoregulatory microbe mediating major effects through a single molecule, polysaccharide A (Dr Dennis Kasper); polysaccharide A mediates immunoregulation via innate and cognate immune system collaboration. The list of buzz words was endless, and patterns of cause and effect in this fascinating hubbub of cutting edge science difficult to keep apart - but then again, - many pathways and interactions leading to alterations in gut flora and thereby alteration in host clinical phenotype may result from the complex interplay of any type of intervention (diet, antibiotics, surgery (gastric bypass), microbe exposure, etc.) and host genetics. Dr Wendy Garrett used some of her time to address the fact that antibiotic treatment may lead to more significant perturbation of the intestinal microbiota than e.g. diets and immunoregulation, and she also encouraged thoughts on how to approach causality in studies of microbial communities. Other things that are interesting include how bacteria "talk" together by quorum sensing to control gene expression and crosstalk between beneficial bacteria (e.g. probiotics) and the intestinal ecosystem, and how these systems can be influenced altogether. 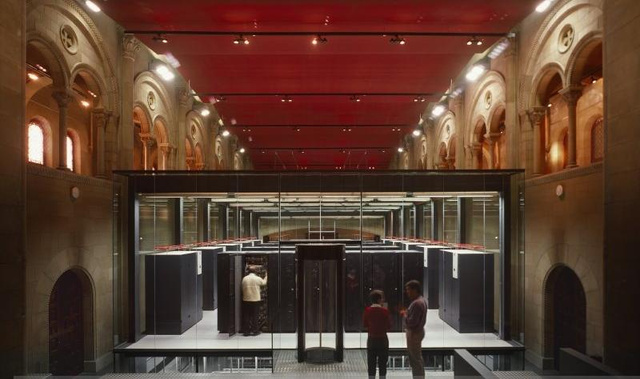 Computer technology - the Creed of today: The Barcelona Supercomputing Centre (with 'Mare Nostrum') located in a former chapel. Source. So, while focus is still on the trillions of bacteria we have in our gut, we hope that it won't be long before common eukaryotic components of the intestinal microbiome will be studied and analysed alongside with bacterial communities. It says on Wikipedia that targeted studies of eukaryotic and viral communities are limited and subject to the challenge of excluding host DNA from amplification and the reduced eukaryotic and viral biomass in the human microbiome. Excluding host DNA is challenging, but not impossible, and who has actually documented that eukaryotic biomass in the human microbiome is 'reduced'? The meeting was very well organised and took place at the Sheraton Hotel in Lisbon. I've storified a list of the #CMHH tweets here in case you are interested in more 'headlines'. I apologise for any misquotes. For those of you who read my most recent blog post and who went on to read Carl Zimmer's article in The New York Times about gut flora transplantation on a woman suffering from chronic Clostridium difficile diarrhoea: The concept of faecal bacteriotherapy is maybe not that new. Allegedly, it dates back to Pliny the Elder and others, who prescribed orally ingested faeces to cure maladies! Stools were, however, incinerated first, and only the ashes ingested. 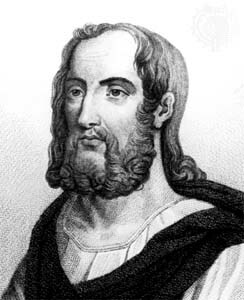 Pliny the Elder and others with him allegedly recommended ingesting the ashes of faeces to cure disease. In less ancient times - in 1989 to be more precise - Tvede and Rask-Madsen from Copenhagen, Denmark (Statens Serum Institut and The Danish State Hospital) reported on bacteriotherapy for chronic relapsing C. difficile diarrhoea in six patients. They hypothesised that absence of Bacteroides results in chronic relapsing C. difficile diarrhoea, and that its presence may prevent colonisation by C. difficile. In the current issue of Microbe Magazine, Young and Aronoff describe some of the mechanisms that may be involved in our indigenous gut flora's ability to prevent the colonisation of potentially pathogenic bacteria such as C. difficile. These include: (1) occupying space (physically preventing contact by newly arrived microbes with the host), (2) directly impairing the growth or germination of C. diffıcile, (3) withholding nutrients or germinants from C. diffıcile, and (4) shaping the host adaptive and innate immune responses. Hence, the concept of dysbiosis and the ideas of manipulating the gut flora in order to "restore order" have been going on for a long time. Metagenomics, however, will assist us in exploring exactly what is happening in much more detail and in a much broader and standardised context than previously possible. We will be able to predict shifts in the structure, function and interaction of microbial communities - hopefully including micro-eukaryotes such as fungi (the "mycobiome") and common protists such as Blastocystis and Dientamoeba (maybe we can call it the "protistome"? ), - and any influence of diet, pro- and antibiotics.